From late November to January of this year, I was super fortunate to have had a solo show for my artwork at the Trinity Gallery in Ottawa, Ontario. It was an amazing opportunity that came with perfect timing in my life. The space of the Trinity Gallery is beautiful and big with a lot of walls to fill! When I first received notice of the opportunity in late December 2017, I was given about a week to come up with my show name and a short blurb of what it would be about. I knew I wanted to show more than one set of work. This was my first solo show and I wanted it to have a bit of range that hopefully would draw interest. Decided that it would have pieces from 3 series in it. Data Reliance – This series stems from my time working in technology, my feelings on how it takes over our lives and where we’re moving with it. Birch Trees at Night – the beautiful Birch captivated me when I first came to Canada and has been a favorite subject of mine for many years. 10 months of crazy work later, we finally came to the opening of the show. It was a ton of work to hang and thankfully I had my husband, who was a tremendous help not only in hanging the show but all the steps along the way. Trinity Gallery is located within an arts centre that has 5 other gallery spaces (along with theaters and art schools) within. They have Meet the Artist days when the galleries change their shows so it is a fun atmosphere with a lot going on and people going from space to space. The event was awesome – even made sure my refreshments were achromatic themed! 😀 I was so fortunate to have family travel from out of town to come on this special day as well as having many lovely local friends come too. There was a lot of great feedback on the work. I even sold a couple of pieces! It was so neat to talk to people and see it being well received. It also was so amazing, such a gift, to allowed in life to see so many of my pieces hanging all in one space (that isn’t my home!). Overwhelmed with gratefulness is how it felt. Here’s some pics of the show up and opening day. If you’d like to see pics of all the pieces on the show there’s a page on my website that shows what all was included that you can view by clicking here. The last couple of months of 2017 and first couple of 2018 have been a whirlwind. Just starting now to surface for a bit of air! Big things have been happening one after the other and I haven’t had a chance to write about them all here on the blog, so am catching up now because they’ve been too good not to share. 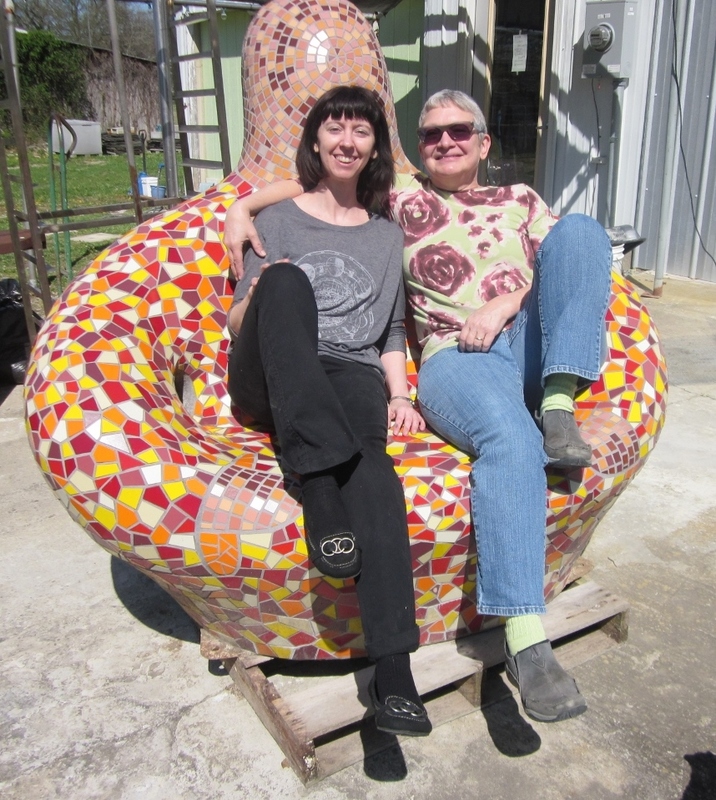 The best thing that happened in all of 2017 for me – was an opportunity to go be an Instructors Assistant for Sherri Warner Hunter at a Concrete Sculpture class held at the Arrowmont school in Gatlainburg, Tennessee at the end of October/early November for 2 weeks. Decided to drive to Gatlainburg from my home in Ottawa Canada. It was great timing for fall colors. I’d never been to Gatlainburg before and was excited to see it and the Smokey Mountains. More exciting though was discovering the Arrowmont school. This school is astonishing. Visit it at arromont.org, if you have any interest in art, craft and learning this is the place to be. The staff are so warm and welcoming, they bring in world-class instructors, feed you tons of fantastic food and are tireless promoters of the value of arts and crafts. Go to their site, look up their classes – you will be amazed. I fell in love with this place. I was nervous about being an assistant and hoped I’d be good. Wanted to do a good job for Sherri and for our class of 10 students. We had a class of all women which was kind of cool! They were all so amazing, came from different backgrounds and were truly delightful to get to know. Sherri is a phenomenal teacher and I learned a ton watching her teach and seeing how she is with the students. It was a great opportunity for me to not be on the learning end in terms of the sculpture – but to get to learn and observe from a teaching perspective. When the time came for me to help students it was so great! I love love loved helping them! I loved seeing them learn, seeing them create and watching their ideas come to life. It was great to see their confidence build and help them be successful. They all created such different sculptures and each and every one of them was fantastic. It was truly a room filled with talent and I’m sure they will all continue to do great work going forward if they choose – which I hope they will all continue with it. There were a few other workshops going on at the same time as we were there, a paper making course, water color, photography, wood marquetry and a pottery class right next door. There was so much talent around the whole time, it was inspiring to see what the other courses worked on. Fun for us – the pottery class had a huge kiln outside our studio and they did a soda spraying technique which caused big flames to come out of the kiln. It was tremendously cool to watch! 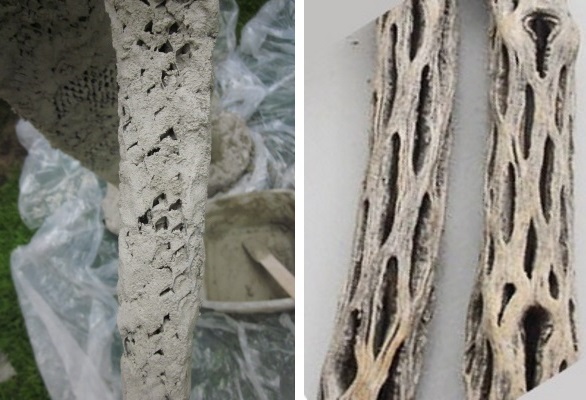 As a bonus for me – when we had slow time or on the weekend I was able to work on concrete sculpture projects for myself. It was great to be able to use the facilities and Sherri’s awesome tools, as well – having a block of time just do work on sculpture and get messy without the responsibilities of home was incredibly freeing. I got going crazy on the weekend and carved a bunch of styrofoam like mad and created way more than I’d intended. But sometimes inspiration (or insanity) takes over. If you’re interested in any other kind of arts & craft, look up Arrowmont’s schedule for 2018. They’ve got a drool-worthy list of workshops available. Wish I could live there and take a gob of courses myself! Carving styrofoam to later cover in concrete is a messy endeavour! One of the students made a whole bunch bees they were so cool! I made a pot head too. 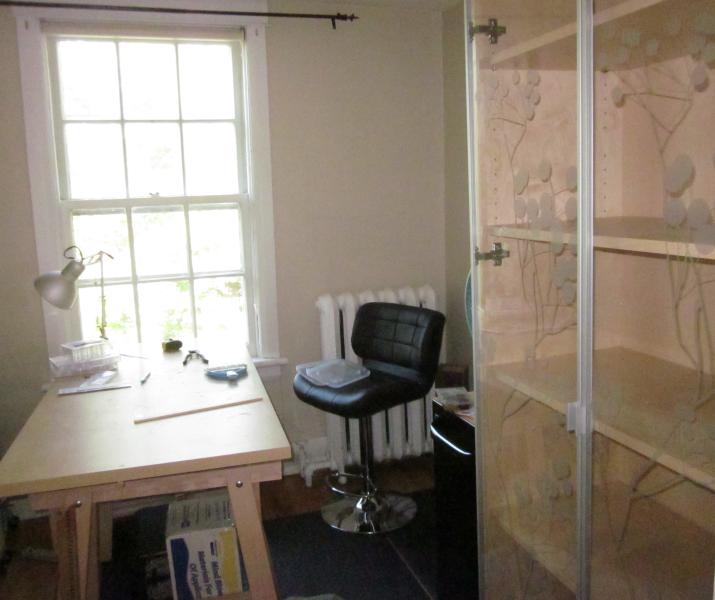 We are moving soon – so all my mosaic supplies have been packed up. 😦 It’s frustrating, especially now that most of the packing is done and we are just waiting till the actual move date. 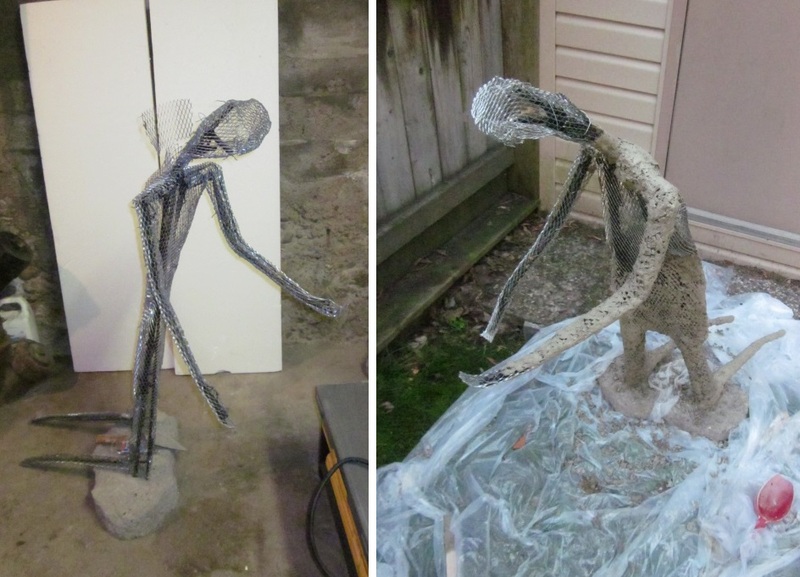 I needed something to work on – so decided it was time to put concrete on a “humanoid” sculpture I’d made in a class with Sherri Warner Hunter in 2014. You can see his initial creation in this old post or if you’re interested in a class on how to create these kind of armatures, check out Sherri’s site! Pre-concrete, he was a metal armature of rebar and wire mesh. The concrete will be the layer to support future mosaic work. During the first coat, I had to be careful not to squish it through the mesh but lay it on with just enough pressure so it stays. I started out with this sculpture wanting an abstract kneeling man – not a true to life man. After I got his basic structure down and started wrapping him in wire mesh, decided he would be a “humanoid” alien. Perhaps having come to this earth – but not doing well in our atmosphere – falling to his knees – outstretching his arms for help. Pics below are of him after his 2nd coat of concrete. I sculpted in some bits of basic face structure as well. Eventually he’ll be mosaic’d – but that will be a project for a later date. Was happy to get him fully coated before we moved, but he’s much heavier now – so perhaps that wasn’t the best plan after all! Oh well, good thing we have strong movers coming to help! Mosaic sculpture – Vote & tell me how it should sit! Previously, I asked for help deciding on a color for the other side of a sculpture I was building for a workshop. Thank you to all the lovely folks who gave suggestions – there were some awesome ones!! I’d loved the ideas of pinks or teals – but ended up not having enough of either one, with no time to order more, had to pick something else. Played around with options and finally settled on a mix of 3 blacks. The different shades give it a nice shine and make it not so flat. Also, stuck in a few strips the white marble just like on the purple side. My favorite part is looking from the purple side through the “tear” and seeing a strip of the white surrounded by black. I’m happy with the result – at workshops it’s always a worry to not be just a derivative of the instructor’s style and I think this turned out for sure “me”. Now – need to decide how it should sit. It was originally supposed to just sit one way – but realized it actually can balance other ways as well. Which way do you like it? Sculpture in progress – what color for the other side? May has been jam packed, took a little vacation, found out we have to move shortly 😦 and started a fun little mosaic sculpture workshop. 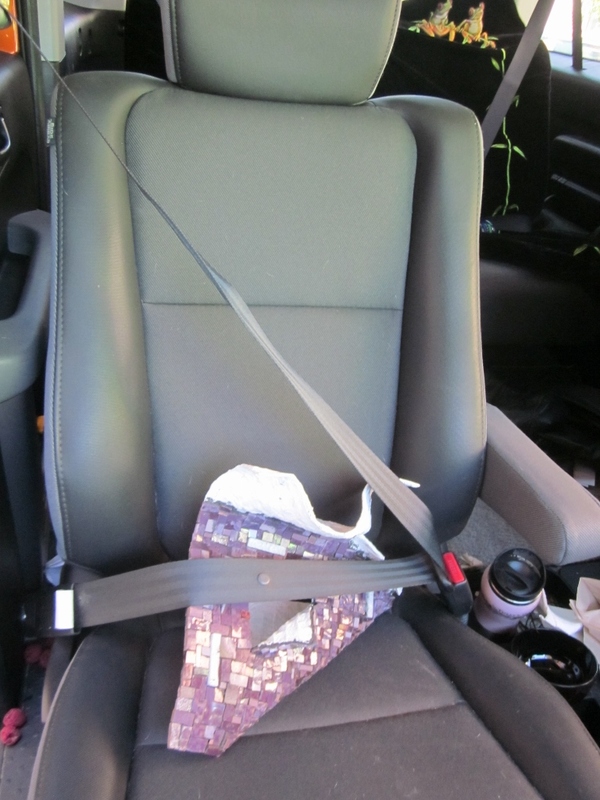 I got nervous driving it home, so I buckled it in for safety!! Decided to take the class as it was a different kind of sculpture technique than I’ve done before. 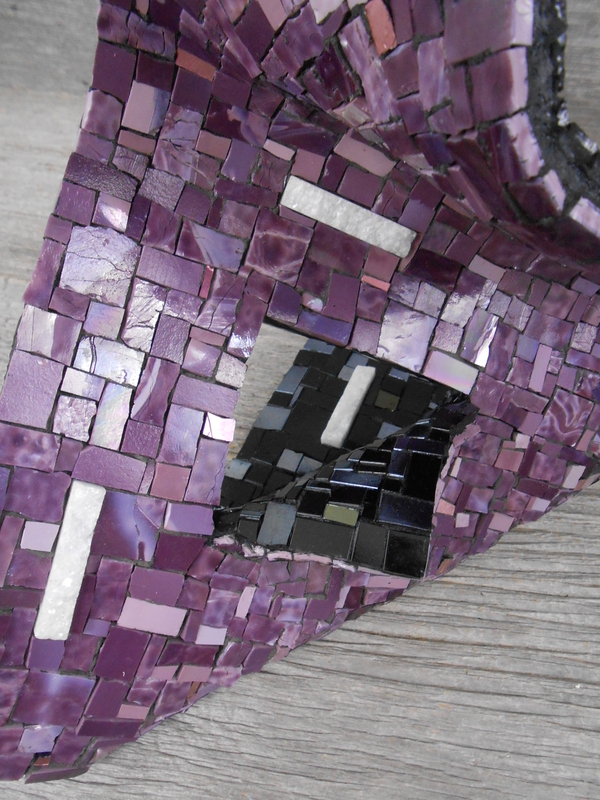 Plus it is great fun to be around others who love mosaic as much as me – kind of a rarity to find! So here’s a few pics of my nutty little sculpture- it isn’t finished yet so don’t judge too harshly! At the teacher’s request, can’t share pics of the process – but here’s some “in progress” of the mosaic part. The color choice of material to cover it with was a little limited – first was going to go with brownish tones (something I never use) but then decided on a mix of purples with some fun white sparkly streaks. I’d planned to do both sides purple – but now thinking maybe the opposite side a different color – perhaps black or maybe white. It can sit many different ways – so depending on how it is displayed you will see the opposite side or parts of it. Have to decide in the next 2 days though as we finish up on Saturday. Do you have an opinion on what color the opposite side should be? Let me know! Write in a comment below – I’d love the input – it will help my indecisive Libra brain!! sitting on it’s head a bit while trying to get into tough curves with the mosaic! what color to do the opposite side? The 2 best classes I’ve ever taken. Been MIA lately, but gearing up now for a summer of mosaic! We’ll be posting more often so be sure to keep checking in! First though – want to share with you all about 2 amazing classes I took this past April! Sitting with Sherri on one of her phenomenal creations! I had the most fantastic opportunity to take 2 classes in creating 3-D sculpture bases with Sherri Warner Hunter at her studio in Tennessee. She is well known for creating amazing 3-D mosaic sculptures, she’s also written a few books on creating concrete sculptures, so I was super excited to be learning from her. In class #1 we learned how to sculpt Styrofoam, then cover it in mesh and concrete for strength. We started with 18” x18” cubes of foam, then had fun learning to use the hot tools (knives & wires) and other non-hot tools to form the block. I created a round-ish shape with some bevel-y parts to it. (pics below) I like it, but am not sure yet how I’ll mosaic it. The 2nd class was building armatures from metal. I’d thought the foam would be my favorite, but turns out – it was the metal! I absolutely LOVED bending the re-bar, cutting it, tying it together and seeing my figure come to life. Inspired by a piece in Sherri’s yard – I created a kneeling humanoid with outstretched arms. He was a challenge, but his metal parts got finished and next he’ll get concrete and mosaic. (pics below) I totally love him – he’s not fully “human”, but maybe he’s alien-esque? Dropped to earth and struggling in our atmosphere, reaching out for help? I don’t quite know his story yet! It was all simply the best, Sherri was so generous with her knowledge and I am thrilled to have these new skills. Meeting my fellow classmates was the cherry on top of all this! I am quite isolated where I live in terms of other people who like what I like – getting to be around others who are mosaic creative types, it was a dream to share the time and experience with them. I was truly sad to leave them all. Long entry this time! Check out pictures of the class projects below – next week I’ll share with you some new mosaic work! 18″ x 18″ block of foam – now to make something out of it! Finished (almost) styrofoam based sculpture – it will now need to be covered in mosaic! Attaching the metal mesh to my kneeling man *special thanks to Polly Price (photopolly on flickr) for taking this photo! A bucket of treasure from the scrap metal yard! Facinated by the horns on this guy! Got to drive by him each day.